From a streetcar map to a 1950 plan for the national capital, this is CBC Ottawa's cartographic cruise through the city's history. 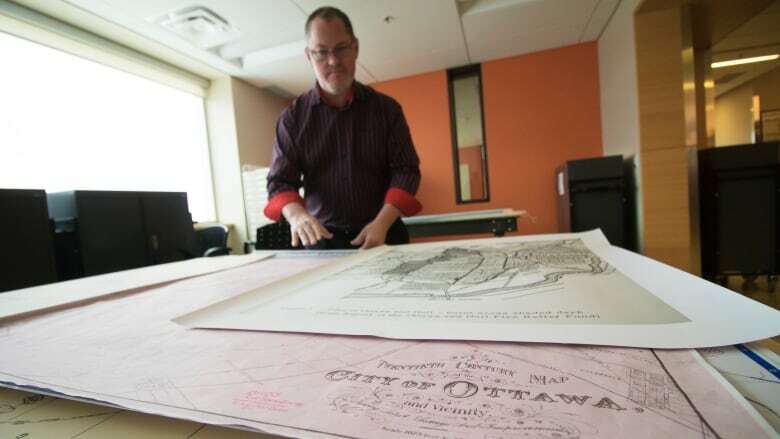 For city archivist Paul Henry, maps are just one more way to tell Ottawa's story. "You can see the resilience of community over time. You can see the evolution of a community over time," says Henry, who recently gave CBC Ottawa access to its vast collection of city maps. "You get a real sense of history in the place names and the street names." We've taken some of those old maps, added a few from other sources, and brought them all together in this attempt to forge a cartographic chronicle of the city's past. 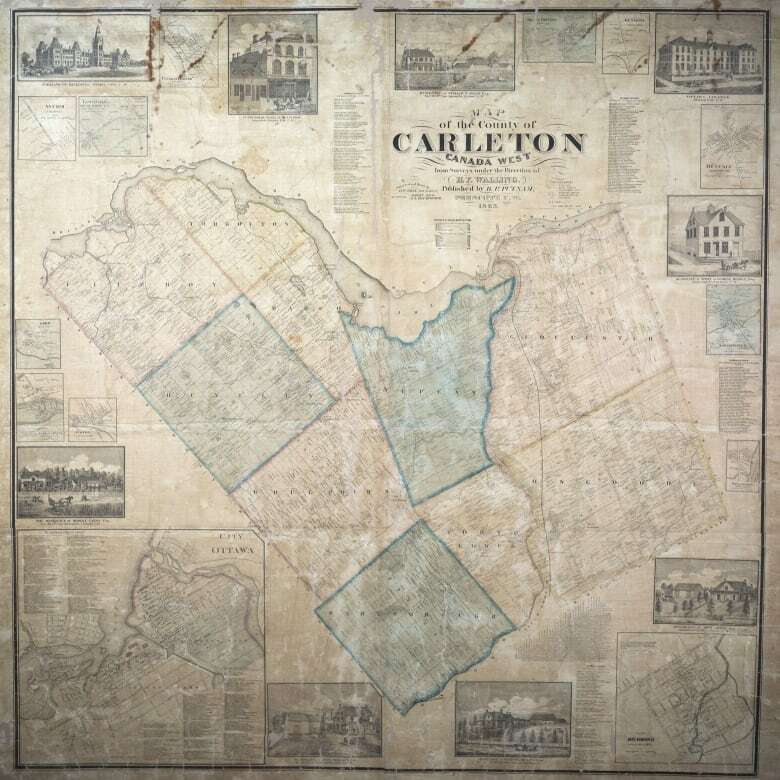 One of the oldest in the city's collection, this 1863 map of the former Carleton County nevertheless "describes in essence what is now Ottawa," Henry said. But not all of it, of course. Four years before Confederation, Ottawa was essentially limited to Lowertown, the ByWard Market and the western and northern parts of downtown. Its population was less than 15,000, and it was dwarfed geographically by the surrounding county and its townships. Some of those communities were roughly the same size; an "apocryphal" story, Henry said, suggested the modern-day rural Ottawa neighbourhood of Richmond was even in the running to be Canada's capital. The Ottawa of 1863 may be tiny compared to today, but not totally unrecognizable. As the inset in the bottom left corner shows, the city's downtown street grid from 156 years ago looks much like it does today. 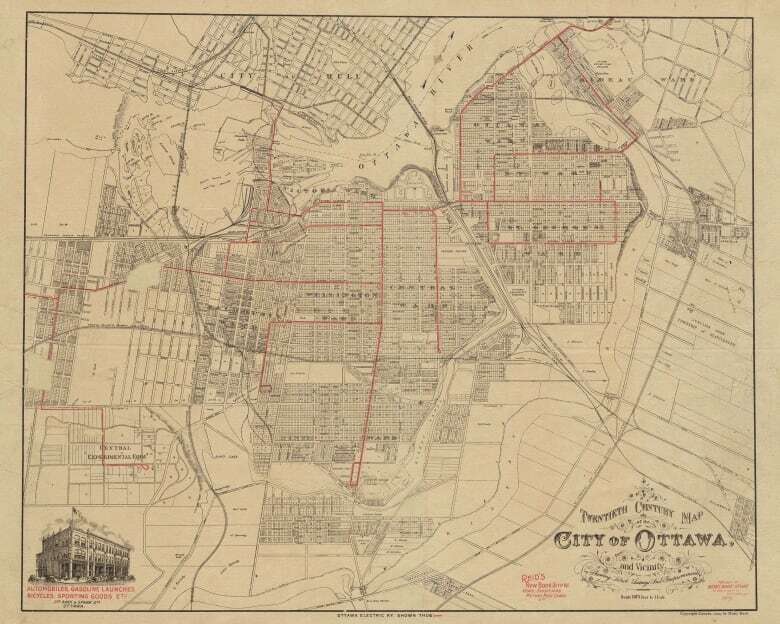 By 1887, Ottawa had been the nation's seat of government for two decades — and this map, another of the city's oldest, shows the accompanying growth. Ottawa's sudden turn from lumber town to national capital led to an "influx" of civil servants, said Henry, and the population doubled to nearly 34,000. Lansdowne Park pops up on city maps for the first time. So does the Central Experimental Farm, Dow's Lake and Rideau Hall. Some of the street names and neighbourhoods may be unfamiliar to an average 21st-century Ottawan, but they show how lumber barons like William Stewart and their families held sway in the capital's early days. The map also shows how tightly connected the city's modern transportation network is to old rail. The path of the Canada Atlantic Railway should look familiar: it would eventually be acquired by the city and turned into the Queensway. Another rail line, meanwhile, runs along what's now the Vanier Parkway. 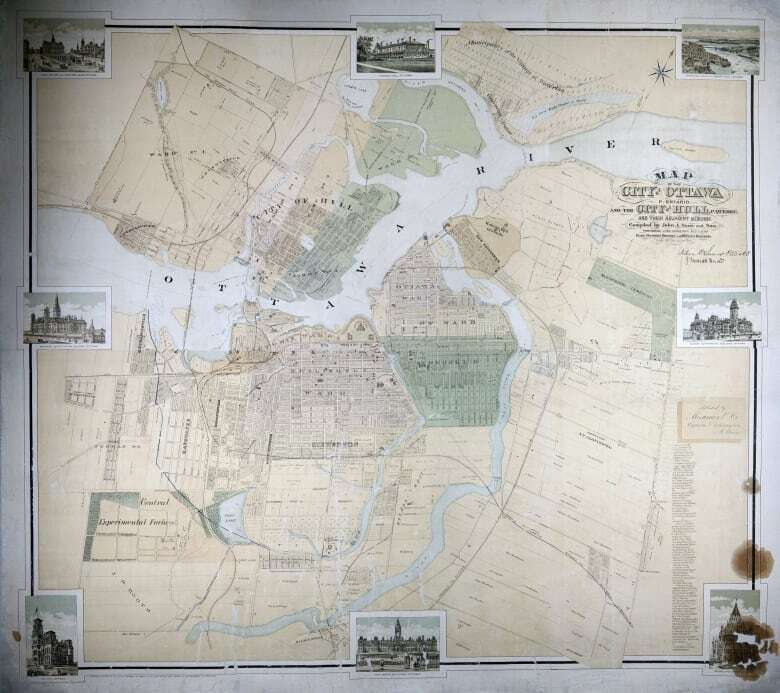 Finally, the 1887 map is a reminder of what Henry called the city's "disappeared" communities, like the small settlement on land later used for the Supreme Court of Canada. There's also a certain working class community on the map just west of downtown whose dismantling in the mid-20th century reverberates to this day. Long before light rail became a topic of great debate and consternation, Ottawa was connected by a bustling streetcar network. This 1909 map shows the peak of that network, which was operated by the privately-run Ottawa Electric Railway Company. And its lines, Henry said, offer a glimpse at life in the early 20th century. The red line heading off the map's west end would have ferried riders to the recently-opened Britannia Park — evidence of its popularity as a weekend destination for rest and relaxation. The line running straight into the heart of the Central Experimental Farm shows its importance as a working farm, while the line running across to downtown Hull testifies to the longstanding connection between the two communities. Streetcar service lasted until 1959. The lines were eventually pulled out and, along with most of the cars, sold for scrap. For Alain Miguelez, the city's history can be divided into two eras: before and after the Gréber Plan. Commissioned after the Second World War, the ideas put forward by French architect Jacques Gréber were designed to "increase the prestige of Ottawa as the nation's capital," said Miguelez, the city's manager of planning policy and the author of Transforming Ottawa, a book about the plan. "Ottawa got an advance taste of what was to come in all other North American cities," said Miguelez. "Everything sort of became bigger — largely driven by a wish to separate land uses from one another, and also for the sake of making automobile traffic flow faster and more freely." The Greenbelt, represented on the map with green diagonal lines, came out of the plan. So did the car-first parkways along the Ottawa River, a big departure from the streetcar era. The plan created worker-only spaces for federal government workers — like the Tunney's Pasture government campus and the National Research Council complex on Montreal Road, both of which appear in crosshatches on the map. Not everything in the plan materialized, of course. 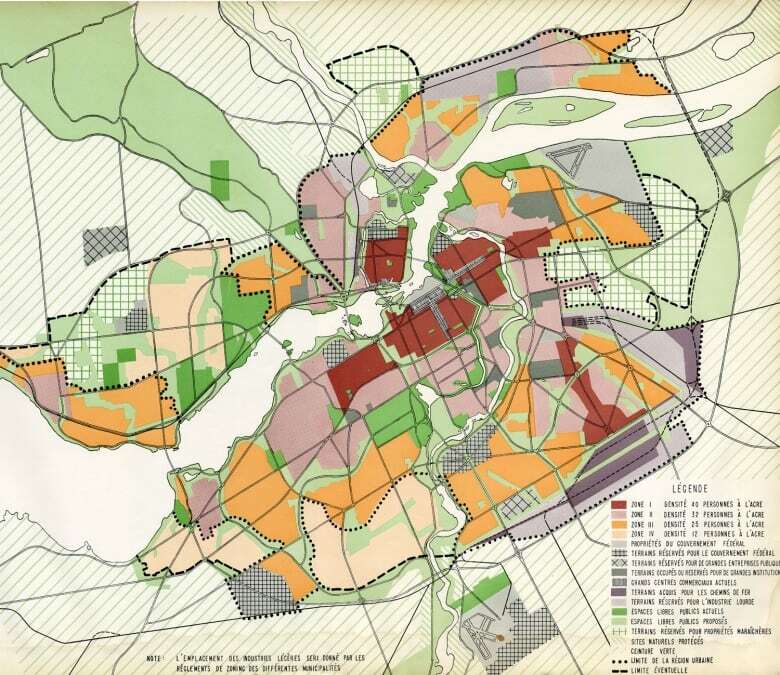 But to this day, Miguelez said, planners are still grappling with how the Gréber Plan changed Ottawa. Ottawa's population hit 200,000 by the mid-20th century, but it didn't stop growing. First came the annexations of parts of the former Nepean and Gloucester in 1950, bringing neighbourhoods like Westboro into the city's fold. Then, in 1999, the former Mike Harris government forced amalgamation upon a number of the province's municipalities — including Ottawa. 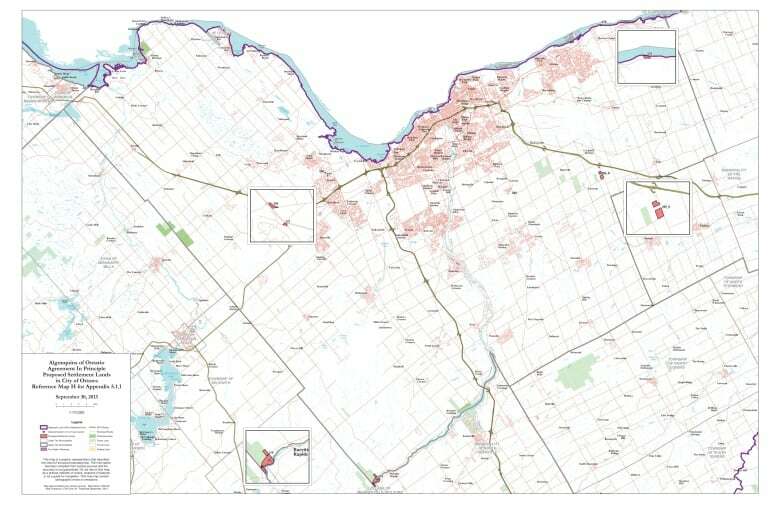 As this highway map from 2001 shows, the decision meant residents of former cities including Kanata, Vanier and Cumberland suddenly found themselves citizens of Ottawa instead. Amalgamation certainly wasn't universally loved: rural communities felt their concerns would go unheard, while city dwellers didn't enjoy having country folks weighing in on urban matters. Eight years after it all went down, former councillor and mayoral candidate Clive Doucet called for the city to be split back up. Obviously, that didn't happen. But amalgamation remains a formative moment in Ottawa's modern history. In fact, as recently as last year, local MPP Lisa MacLeod cited it as a reason that Ottawa, unlike Toronto, wouldn't see the size of its council contracted. Ever attended a concert or a poetry reading in Ottawa where the master of ceremonies notes it's taking place on unceded Algonquin territory? This map helps explain why. Algonquin people have laid claim to their historic hunting and fishing territory around Ottawa for more than 250 years, on the grounds that no treaty ever extinguished their rights to the land. In 2016, the Algonquins of Ontario struck a modern treaty with the provincial and federal governments — and this snapshot of the Ottawa area appears the agreement-in-principle forged through those negotiations. The deal encompasses roughly 36,000 square kilometres, including a vast swath of the Ottawa Valley. The blown-up boxes in the above map show federal lands in Ottawa that are "for the most part vacant," said Robert Potts, senior negotiator for the Algonquins of Ontario. It also shows how European settlers imposed their own boundaries upon the people who traditionally called the region home, Potts said. "Our job, our task, is to try and reintroduce the Algonquin way of thinking ... that Aboriginal presence that has always been there," Potts said. If maps can truly tell the story of Ottawa, technological changes are increasingly allowing its citizens to become the storytellers. "The mapmaker used to be the person who said 'This is what you get to see,'" said professor Fraser Taylor, director of the Geomatics and Cartographic Research Centre at Carleton University. "That's changing, and changing dramatically. Mapping is becoming more democratized." Technologies such as smartphones and access to a "whole range of qualitative and quantitative information" are allowing people to take mapping into their own hands, Taylor said. 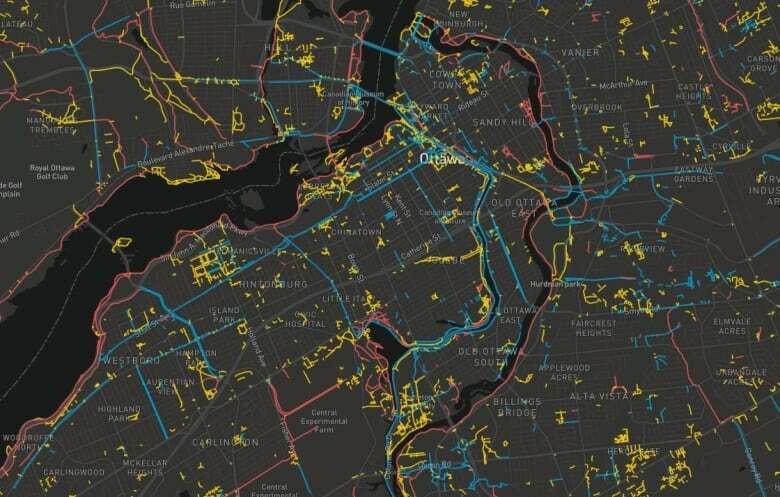 This screenshot of a map from Bike Ottawa, which uses crowd-sourced data to give cyclists an evolving look at plowed winter bike routes, is a "small example" of that trend, he said. "In the past, because the map was a concrete piece of paper, you got one answer to your question," said Taylor. "Instead of just presenting one perspective, we can [now] present a variety of different perspectives. So people can see there's no right or wrong answer quite often — but complex sets of perceptions. And each of those perceptions has validity in its own right." Maps courtesy the City of Ottawa Archives, Queen's University, Ontario's Ministry of Transportation, the Algonquins of Ontario and Bike Ottawa.